My calendar was featured in Decor8 2010 calendar round up today!!! My special thanks to lovely Holly! Wow! 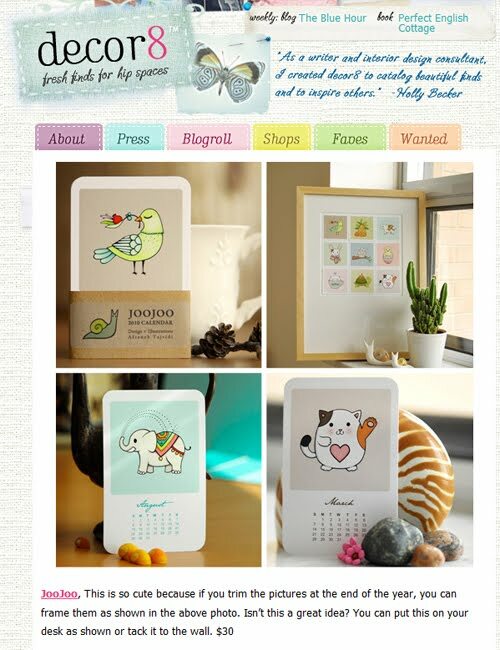 Congrats sister >:D< Cute calendar, I can't wait to have it! What wonderful news Afi! Congratulations, I'm so so so tickled for you ♥! That is so exciting and it looks beautiful! Yay congratz!! It's really a beautiful calender! I am sooooo happy for you! Have a lovely merry happy weekend and love to you! p.s.= I'm waiting for a money trasnfer on my paypal account so that finally I can order those cute snails magnets!! Congrats for your artwork! Soooo cute! WOW!! These are adorable JooJoo! I love calendars and this one is super special. Congratulations..they look marvelous!